For the 54th October Salon, No One Belongs Here More Than You, I have been invited to deliver three performances on three consecutive finissage days. 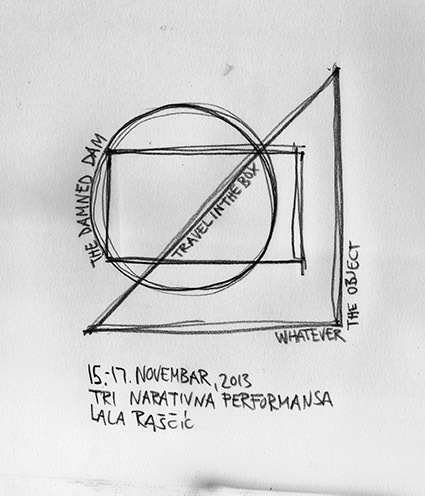 I will be performing The Damned Dam, Travel in the Box and Whatever the Object. Each of these performances will be a new, unique rendition of a former project. The Damned Dam will be the first time I perform this work live in English. The narrative, carefully translated from my mother tongue, teems with alliteration, rhyme and evocative poetic imagery. The story is set in the near future and follows two characters as they battle social injustice and environmental disaster, inspired by motifs from Bosnian oral storytelling traditions. I am accompanied by the sound of the saz, a traditional instrument, played by Jusuf Brkić. Travel in the Box is a project, which since its conception, in 2007, has been undergoing transformation with every presentation. It’s most ambitious realization was for City of Women, Ljubljana in 2009 when I commissioned several poets and poetesses to write verse on the topic of travelling in a box, inspired by two stories of persons that shipped themselves in a box, in search for a better world. I will deliver a lecture performance which will map the diffrent versions of the project. I will also be reading poetry by Meša Begić, Andreja Dugandžić, Marko Tomaš, and Faruk Šehić, among others. Whatever the Object is a script originally written for three actress for a three channel video installation, produced in 2013. Whatever the Object explores the notions of translation and transmutation, based on three found pages of an unidentified book, analyzed as an object and a source of meanings. The script follows an almost forensic analysis of the found pages, their content, and their physical properties, concentrating specifically on one sentence singled out from the text. This will be the firs time Whatever the Object is performed live. The performance will be in English, German and BHS. (2013); A Load from the Inside – Reviewed, Sigmund Freud Museum, Vienna (2011) and The Damned Dam, POGON, Jedinstvo, Zagreb (2010). Her works are a part of both private and museum collections in Sarajevo, Zagreb and New Orleans. Jusuf Brkić was born in Gradačac, Bosnia and Herzegovina and has been playing the saz since he was 11, studying with the renowned master singer, saz player, and author of a number of significant sevdah compositions, Dr. Hašim Muharemović. Jusuf has performed numerous concerts and festivals in Bosnia and Herzegovina and internationally. He appears in the the award-winning documentary film Sevdah, directed by Marina Andree (2009). Currently, he is preparing his first studio album, due to come out in 2014.